We love the Chicken-Less Mandarin Orange Morsels from Trader Joe’s. 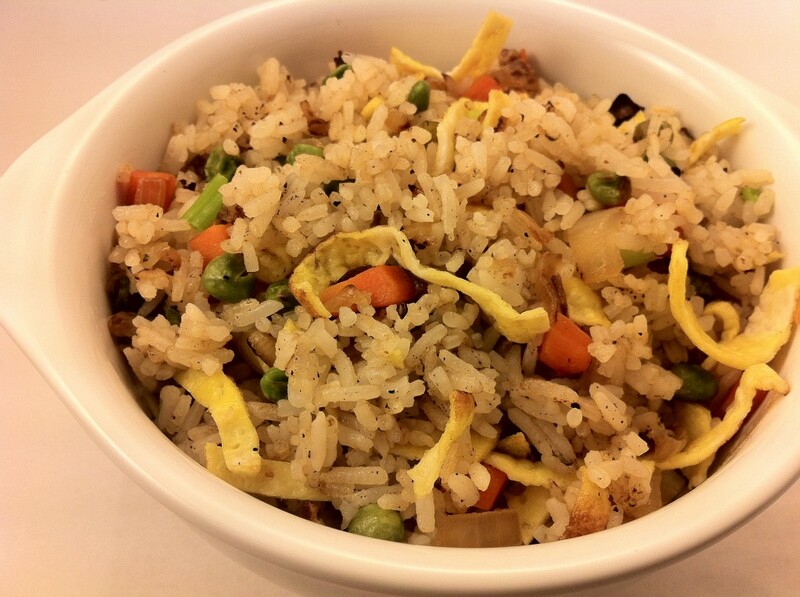 So last night I cooked up a quick fried rice to go with it. Day old rice works great, but if you don’t have any around, you can cook the rice while you’re starting the other stuff. Cook your rice if you need to. Heat the 1/2 teaspoon oil on a non-stick skillet and cook the eggs in a thin omelette. Remove the egg from heat, roll up and cut (like the picture). Heat the 1 teaspoon oil in a wok and add the onion and garlic and cook until the onions are translucent. Pre-boil the carrots (I use a bowl with carrots and water in the microwave for 3 minutes). Add the carrots and peas to the wok, add a little salt and cook the peas through. Push everything to the side and add the rest of the oil to the pan. Once the oil is heated, throw in the rice and let it crisp in the oil a little. Add the salt and pepper and then mix everything together. Throw in the egg and green onions and give it a final stir.